CURRENT STATUS: After Extinction was announced by Syfy Channel in August 2008, it spent some two and a half years in limbo. Brad Wright finally announced on April 17, 2011, that MGM would not be producing this or any other Stargate movies in the near future. The script has been written by Joseph Mallozzi and Paul Mullie, but Stargate: Extinction will most likely not be produced. Below you can find additional notes and comments in chronological order, beginning with the network’s announcement of the film in August 2008. Co-writer Joseph Mallozzi codenamed the Atlantis movie "Project Twilight" during the weeks before it was announced. "Once we realized that with the prospect of another series going forward ... and SG-1 movies going forward, this was the right way for the partnership between MGM and us and SCI FI to go forward. If they weren't in complete agreement on where to go next, if it wasn't a joint decision, there wouldn't be a movie deal already in place." "I can't predict whether an ongoing series of Atlantis-based movies will prove successful. However, if the performance of the two SG-1 movies is anything to go by, the audience is out there." "[The film] will be more [like] Continuum than Ark of Truth in that it will continue the story of Atlantis in a one-off offering. While the adventure will be stand-alone, the character moments will certainly draw on past experiences and future potential." "I think these things lend themselves to a bigger, kind of high-production-value, two hour event, which is great. This brief statement was the first indication of a time frame for the film's production at The Bridge Studios in Vancouver, B.C. As of March, the film has not been given an official green light for filming. Actress Rachel Luttrell ("Teyla Emmagan") told GateWorld in an interview that neither she nor other members of the Atlantis cast had yet been contacted about the film (see below). Executive producer Joseph Mallozzi stated that this doesn't mean it has been postponed (see below) -- indicating that the summer shooting date was probably never set. "A wormhole drive is just that -- a drive that sends the ship through a wormhole, like a person stepping through an active gate. The advantage being that you don't 'travel' through hyperspace for hours on end. You get de-molecularized, or whatever you want to call it, and then spit out at the other end a few seconds later. It's basically instantaneous, which is why I needed it as a device in ['Enemy At the Gate']. Some people have complained that it was a bit of a deus ex-machina, to which I don't really have much of a defense. "None of us really know what's going on, and if it happens, great! Last I heard was that they were just going to kind of see how things played out in terms of viewership with Universe and potentially viewership with the SG-1 films that they have already shot [airing in March and April, 2009]. Since the city of Atlantis and its Stargate are now on Earth (having landed, cloaked, in the San Francisco Bay at the end of the series finale), which Stargate on Earth now takes precedence for incoming wormholes? "I believe the Pegasus gate takes precedence," executive producer Joseph Mallozzi said on his blog. "Allow me to clarify a few things about the Stargate Atlantis movie. Back in the 2008, we floated the possibility of shooting a two-hour Atlantis movie. The idea was to roll right into it right after episode 20 and then play it by ear. If the show got picked up for a sixth season, those two hours would form the first two episodes. In the event the show was not picked up, then we'd already have a movie in the can. "Alas, Project Twilight (which is what I dubbed the two hour event at the time) didn’t come to pass. The series ended and focus shifted to Stargate Universe. But not ALL of the focus because the intention has always been to make a movie. Actually, the focus has been to make two movies: an SG-1 movie, and an Atlantis movie. "Now many of you are asking: 'Hey, we hear that production on the Atlantis movie is being held up by the economy and yet, you have the money to make a new series and that SG-1 movie. What gives?' Well, first of all, it's not a simple matter of us getting a whack of money and being able to pick and choose the projects we want to apply it to. Each production whether it be SGU, SG-1, or SGA, is contingent on their respective deals. And no two deals are alike. Furthermore, part of a project's production budget is made up of licensing fees from various broadcasters, sales to various territories both domestic and international. Now these entities are a fickle bunch and won't just buy anything. If they want product A, you can't just replace it with product B. And that's just one aspect of the many elements that go into any given deal. The bottom line is that the deal in place for Stargate Universe has different components than the deal for the SG-1 movie, which has different components than the deal for the SGA movie (yes, in spite of the fact that they are both Stargate movies, the deals are different). "So even though the SG-1 movie has been greenlit, I can assure you that plans are still in place to move forward on the Atlantis movie as well. Brad is working on the SG-1 script while Paul and I hope to have a first draft of the Atlantis script by month's end (we're already past the halfway mark). No firm production dates for either movies, but if I was a betting man, I'd be looking at this fall. "Heard word back on the Stargate Atlantis movie script from two fronts -- creative and business -- and both responses were overwhelmingly positive. Some confusion (not surprised given the complexity of the story), so we'll make a point to streamline and clarify in the next draft. "By now, I had hoped to hear back on the ultimate faith of Stargate: Extinction (novel? comic book? radio play? performance art piece?) but, alas, it's been very quiet. I will say that when Paul and I set out to write the script for the proposed Stargate Atlantis movie, we did so in the hopes that, ultimately, it wouldn't be produced as a movie at all but as the first two episodes of SGA's sixth season. Codenamed 'Project Twilight,' it would have focused on the city of Atlantis, its personnel, and the journey back to home to the Pegasus Galaxy. Ideally, that would set the stage for the thrilling 18 episodes to follow -- or, at the very least, the jumping off point for future SGA movies. "The movie would have picked up not long after the events of the Season Five finale, 'Enemy at the Gate.' In the opening scene, two astronauts (who turn out to be a couple of familiar faces -- Amelia Banks and Major Lorne) take a walk on the surface of the moon, their lunar stroll ending with a reveal of the city of Atlantis. A shuttle carrying Sam Carter and a group of dignitaries sweeps overhead and lands. "Within the city's atmospherically shielded confines, Carter and her guests meet up with the science team headed by -- who else? -- Rodney McKay. Frustrated by the interruption to his ongoing research, McKay demonstrates a certain impatience with the whole dog-and-pony show, running through standards explanations, overviews, questions, and answers until -- an alarm suddenly sounds. The bewildered dignitaries are ushered out, leaving McKay, Carter, and Zelenka to investigate. "An examination of the city's systems reveal the worst. A self-destruct has been initiated -- a safeguard, Rodney surmises, put in place by the Ancients in the event Atlantis was ever removed from the Pegasus Galaxy. And, once triggered, it cannot be disabled. Nothing short of a return to the Pegasus Galaxy will save the city from certain destruction. 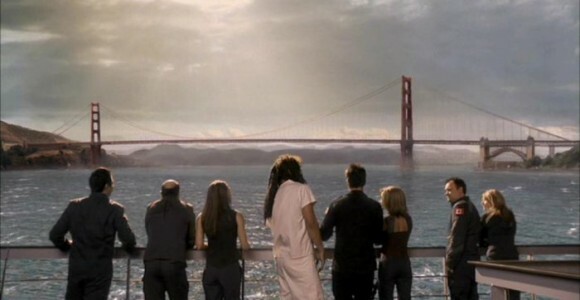 "Of course, it's time to get the band back together and we check in with our various team members as they are called up and beamed away for the return journey: Teyla and her family, Keller, Beckett, Lorne, Zelenka and, of course, Sheppard and Ronon who are plucked away while receiving treatment at a local hospital following a barroom brawl (we went back and incorporated the scar actor Jason Momoa received following an incident near his L.A. home). Once everyone has assembled, McKay gives them the 411. Given the time constraints they face, they have to get back to Pegasus as quickly as possible -- meaning they'll have to use the wormhole drive again. Zelenka calculates that two jumps should do it. "And they're off. Sort of. The first jump ends up burning out the drive, rendering it useless and leaving them stranded with the countdown click ticking down. However, a scan of the surrounding plants turns up a habitable world within range. They go there seeking help and, instead, end up involved in a wild time-travel themed adventure in which Todd, the wraith, turns out to be, simultaneously, their hugest threat and biggest ally.